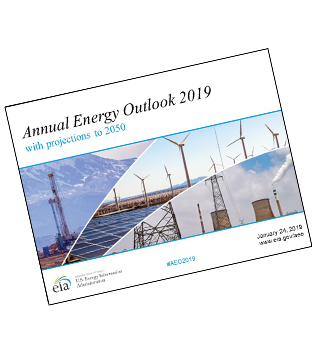 EIA's Annual Energy Outlook 2019 provides modeled projections of domestic energy markets through 2050, and it includes cases with different assumptions about macroeconomic growth, world oil prices, and technological progress. The United States becomes a net energy exporter in 2020 and remains so throughout the projection period as a result of large increases in crude oil, natural gas, and natural gas plant liquids (NGPL) production coupled with slow growth in U.S. energy consumption. Of the fossil fuels, natural gas and NGPLs have the highest production growth, and NGPLs account for almost one-third of cumulative U.S. liquids production during the projection period. Natural gas prices remain comparatively low based on historical prices during the projection period, leading to increased use of this fuel across end-use sectors and increased liquefied natural gas exports. Provides custom data views of all AEO2019 cases. All available cases can be charted and the data for them downloaded.